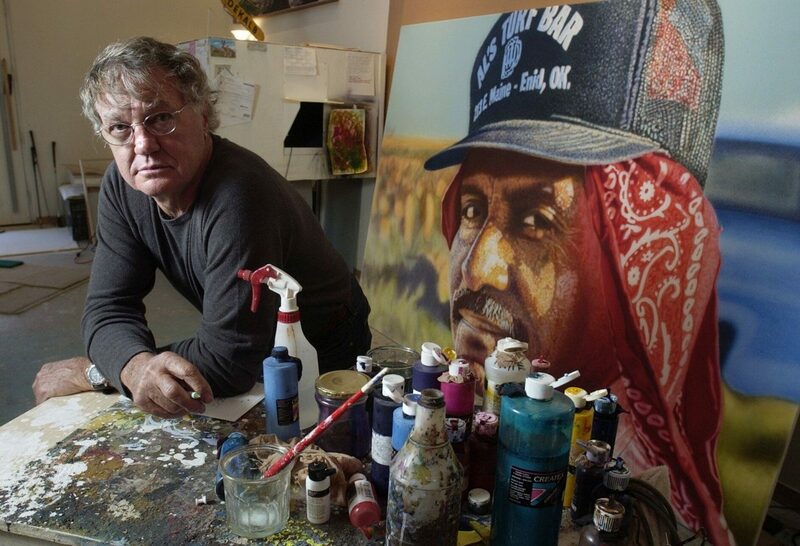 West Coast Premiere, the Museum presents this exhibition of Colorado artist Don Coen’s stunning large-scale portraits of migrant workers. Over two decades, the artist spent hundreds of hours in the fields of California, Colorado, Idaho, Texas and Florida alongside the workers, showcasing each subject’s personality and work ethic in a style he calls “cinematic.” Coen spent his youth working on his family’s Lamar, Colorado farm, and seeks to make visible these often unnoticed laborers. He will travel to the Museum for a speaking event on his work. The exhibition premiered at the Phoenix Art Museum in 2014, and was shown at Colorado Springs’ Fine Art Center, and the El Paso Museum of Art in Texas; this is its first exhibition in California. Watch a segment from the Today Show about this exhibit, below. Don Coen grew up on a farm on the high plains of eastern Colorado. He began painting giant portraits of migrant workers 20 years ago and has made it his life’s work. NBC’s Harry Smith introduces us to the artist whose paintings give a face to workers who often seem invisible. Around the world the agriculture industry relies on seasonal laborers to harvest crops. In America, it is estimated that 1.3 million citizens travel from state to state working on farms, with many more traveling under work visas or as undocumented laborers from other countries. The work is difficult, the pay is typically low, and the long-term exposure to pesticides used on crops is dangerous to the workers’ health. Yet the service the migrant farmers provide is vital to American agriculture and our nation’s economy. Colorado-based artist Don Coen grew up working on his family’s farm and has an appreciation for the hardships farm laborers endure. For more than three decades, he has focused on making realistic paintings and finding interest in rural, everyday life. Executed with a non-traditional airbrush technique, The Migrant Series features 15 large-scale images created between 2001 and 2010. In 1992, Coen began taking photographs of migrant farmers during his travels around the country, an interest that developed out of his early experience of working on his family farm. He typically interacted directly with the workers he encountered and, wherever possible, received permission to take their photographs. The artist’s collection of photographs grew into the thousands before he began his painting series in 2001. Coen’s emphasis is on the humanity of the individuals portrayed, and the large scale makes them too big to ignore. In this way, Coen hopes to bring attention to a segment of society that is too often overlooked. Born on November 24th, 1935, in Lamar, Colorado, Don Coen attended Lamar Junior College and then received his BA in Advertising Design from the University of Denver and his MFA in Ceramics and Fine Art from the University of Northern Colorado. Represented by the Gerald Peters Gallery in Santa Fe, he has had one-man shows across the American West, Minnesota, and Illinois, and his work is found in public and corporate collections from Idaho to Texas and from Arizona to New York. Information throughout the exhibition draws on the artist’s own observations about the people he has encountered while traveling to farms in California, Colorado, Florida, Idaho, Oregon, and Texas.